Thanks to all of you who have asked about our situation in relation to the brush fires going on in LA. Right now we’re fine. It’s an inconvenience but no actual danger, at least not to us. Some smoke to make our eyes scratchy and allergies kick up, plus lots of horrible traffic as major freeways get closed for days. The wind that’s driving the fires is also a pain, but so far our only damage is to our Christmas lights and a handful of small branches broken off of trees.. The fires themselves are all at least 10-15 miles away from us – LA’s a really, really big place. Our biggest danger would be if another fire broke out upwind of us (Simi Valley, Porter Ranch, etc) and was driven in our direction. Then we might need to think about what to put in the car and things can change quickly. (The fire in Ventura County went from zero to 40,000 acres in less than twelve hours.) But so far, so good. 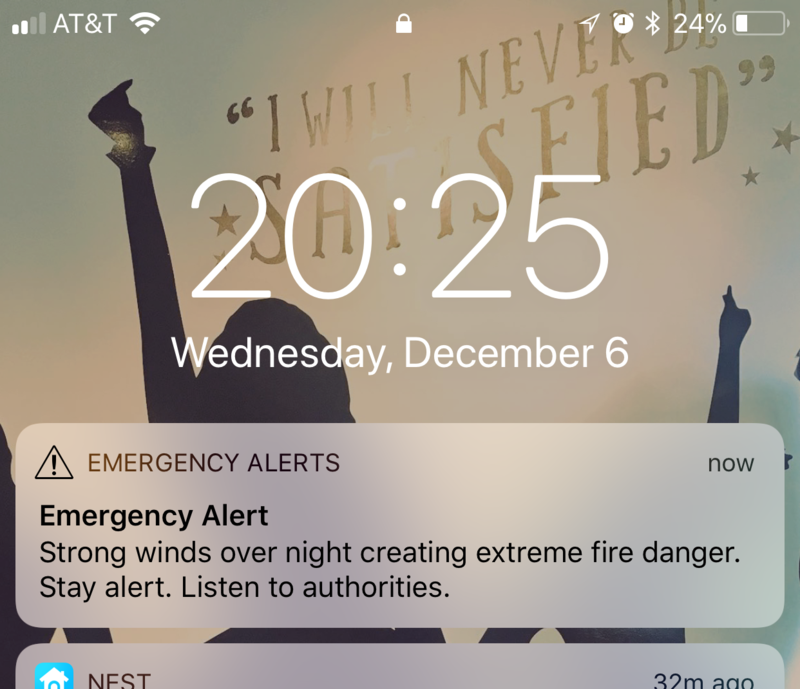 This warning was sent out by text message to over 10,000,000 phones in Southern California. Apparently the relative humidity is already in single digits and is expected (in some areas) to drop down to about 4%. The winds are expected to be at 40-50 mph with gusts in the mountains (where the fires are) and below the canyons (where the fires are) up to 80 mph – or worse. We woke up this morning to a fourth major fire, this one right in the Sepulveda Pass, between the San Fernando Valley and Santa Monica, along the 405 Freeway which normally carries a few million cars a day. I’m sure you’ve seen the video. So, we’re good. For now. But it’s enough to have me spending the evening pulling some boxes off of the shelves and making a couple of lists and being ready. Because we may get that 30-second or 5-minute or 15-minute notice to evacuate. I would rather think about it now, than a 04:23 AM. 15 miles is nothing if the wind shifts. Glad to hear you’ve got your ‘Pack n Go’ sorted. Stay well.